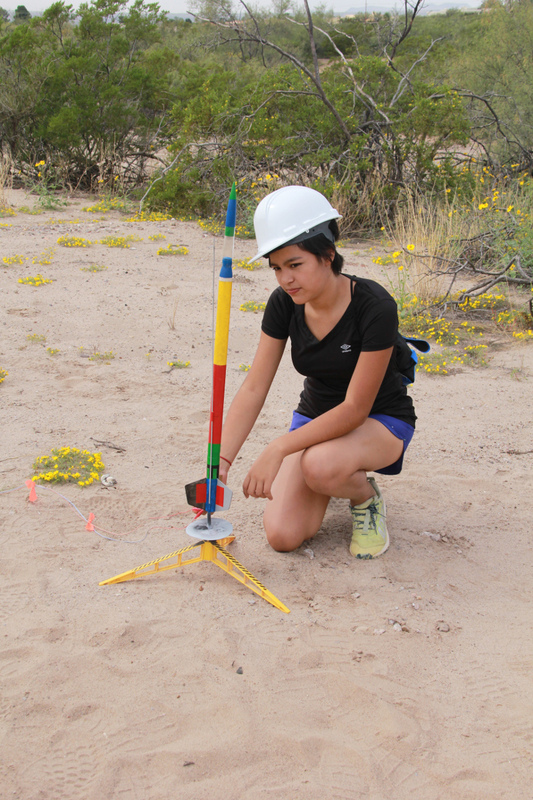 October 7, 2016 Today, Friday, 7 Oct., the middle-schoolers – Arabella, Frankie, Kira, and Xitlali – went to the desert again with teacher and board chair Dr. Vince Gutschick to launch rockets. They’re testing the hypothesis that the rocket altitude scales with the engine impulse taken to the 1.5 power. They had two more successful launches, followed by a fun launch of a high-altitude rocket. For the 2 experimental launches they had 2 widely-separated observers measuring angles in order to compute the rocket altitude by geometry. The setup is demanding, as is the rapid measurement of angles. They made the apex of the flight more visible to the observers by putting black printer toner just behind the nose cone that gets ejected. OK, a little messy, but fun and useful.